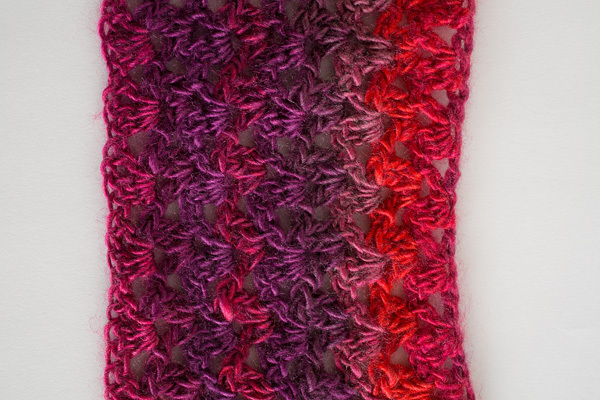 This gorgeous keyhole scarf, worked up in a vivid variegated yarn, showcases the deep reds and violets of the season in Red Heart’s Unforgettable line. The shell-like construction and vivid colors give an airier feel to this autumn scarf, and the optional, repositionable flower allows for customization. Add an optional applique to your keyhole scarf to fully customize it. 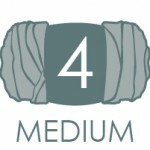 The scarf is made in back and forth rows. Row 1: Turn, dc in 4th ch from hk, ch 1, sc in the same st, * sk 2 sts, (2 dc, ch 1, dc) in next st, repeat from * to complete row. Rows 2-4: Turn, ch 3, in each ch 1 sp (2 dc, ch 1, dc) to end, dc in last st. Note: Place stitch markers in the 9th and 14th ch 1 sp of row. Row 5: Turn, ch 3, in each ch1 sp until you reach the first st marker, (2 dc, ch 1, SC) in that ch1 sp, ch 15, (sc, dc, ch 1, dc) in next sp marked with st marker, (2 dc, ch 1, dc) in each ch1 sp to end dc in last st. Rows 6-9: Turn, ch 3, in each ch1 sp (2 dc, ch 1, dc) to end, dc in last st. Fasten off. Weave in ends. Ch 4, sl st to first ch to join. Rnd 1: Ch 4 (counts as first dc and ch 1), (dc, ch 1) in circle 7 more times, sl st to the third ch of the first ch 4 to join. Rnd 2: In each ch1 space (sl st, ch 1, tr 2, ch 1, sl st to same st). Sl st to the space between the first and last petal. Rnd 3: * Ch 3, sl st to the space between each petal, repeat from * to complete round. Rnd 4: In each ch3 space (sl st, ch 1, dc, tr, dc, ch 1, sl st to same st). Sl st to the space between the first and last petal. Fasten off. Weave in ends. Sew a button to the back of the flower to make it removable and repositionable. Button into desired place on scarf. 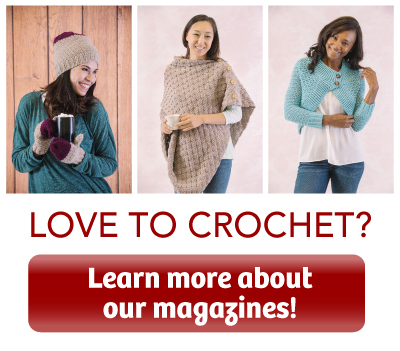 Have you ever crocheted a keyhole scarf? I have never made a keyhole scarf but I really would like to try one. Awesome, I love how this looks! Seen them, not made one. Love the flower – makes it special. Thanks for the free pattern. No- but I love the look of this one! Can’t wait to make it! Yes, for my sister, years ago. I have never crocheted a keyhole scarf. I will have to give it a try. You can never have enough scarves. I have not made a keyhole scarf. I have made scarves but not a keyhole one. I think so. I know I’ve made them but can’t remember if they were knit or crocheted. Don’t think I have done a keyhole scarf, but like the idea. I’ve never made a keyhole scarf; looking forward to trying it! Yes, I recently tested a keyhole scarf for a designer. Yes and really like them! I think you should do it the way it calls for every other row it will be a shorter stitch making it tighter and a different look. I have not made a keyhole scarf before. I’ve had them from others who made them. I’m looking forward to trying it for myself! No. I do like how it eliminates bulkiness though. Not yet, but this one is so pretty that I may just try it! No never even knew it existed. Excited about this one though. Looks beautiful. I have never made a keyhole scarf. I live in Hawaii so there isn’t much need for one. I have never attempted a keyhole s are but will like the challenge. Thank you. I have made one keyhole scarf. I like the look of this one better than the pattern I did. This will be my first keyhole scarf. I have seen some of my friends wear these & I think they look so comfy. I have never crocheted a keyhole scarf; however, I did just reteach myself crochet after a 35 year hiatus so the pattern is going to join my to-do list. I’ve never made one, but I’ve wanted to for a while now. This one is gorgeous! I’ve never made a keyhole scarf but I may attempt this one. I admire both the stitch design and the colours. No, I always thought they were more complicated. Think I’ll give this one a try. 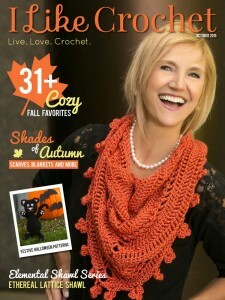 I have never crocheted a keyhole scarf but I think it will be a great addition to my scarves this winter. I have not made a keyhole scarf before. I am very thankful to you for offering this pattern so may try it. No I have not. But I am excited to learn this new pattern! Not this particular one, yet… but yes, I’ve crocheted, and knit them! I’ve never made this type of scarf. Looks so pretty! Yes I have crocheted a key hole scarf. I made a black and purple one for my sister. Yes I love to crotchet but no I have never made a keyhole scarf. 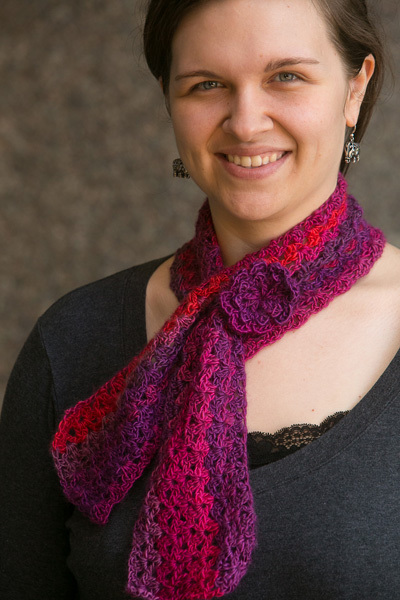 Love this scarf, hope to make a couple for Christmas presents! Thank you! I have never made a keyhole scarf, but would love to. No, I haven’t done a keyhole scarf. I’ve done many other styles, but this was one on my to-do list. I have not crocheted a keyhole scarf, but I have knit one. They stay on better than a plain, straight scarf does. I remember my scarf falling off all the time in high school! How many times did I have to go to the office to lost and found to get it back???? This is lovely. I have knit several keyhole scarves. I’m definitely going to try to crochet this one. I have never made a keyhole scarf before but I plan to make one now!! no, ii have not crocheted a ‘keyhole scarf’, but have seen several patterns for them. this one is lovely, i have several skeins of unforgettable yarn & now have a specific use for them. thank you. I have done one other keyhole scarf. It has been a long time ago. I will have to attempt another one in the spring. Lovely light weight scarf. Thank you! I’ve never made a keyhole scarf before but I look forward to trying this beautiful pattern! This is pretty, but I think I need to practice more before attempting it! Row 5 of scarf is written very poorly and is not clear. I’ve tried to work it a few times. One more time, and then I will have to move on to another project. After row 5, it doesn’t say how or what stitch to use or how attach to the ch 15 from row 5. I am using an iPad and don’t have a printer, how can I get this free pattern sent to my email? Row 1 instructions are the pattern for the row. I think the writer meant to say double crochet instead of making that last stitch of the pattern a single crochet. I think either way would work, but I would probably turn that sc into a dc. The repeats are all 2 dc, ch 1, dc because that first dc you took into the 4th chain from the hook acted as 2 dc (the first 3 chains being the first dc). Row 5 is instructions for the keyhole in the scarf. Take a deep breath and follow the instructions. The space between the markers is going to be where the keyhole will be. The ch15 in Row 5 span 4 of the (2dc,ch1,dc) in Row 4. So for Row 6, when you get to the ch15 of Row 5, I would (2dc,ch1,dc) in 1st chain, skip 2 ch, [(2dc,ch1,dc), skip 2 ch)] 2 times, (2dc,ch1,dc) in last chain. Then resume regular pattern across to the end. I’ve just finished this and it looks ok with the Dbl in 4th chain ch 1and 1 sc in same stitch as both ends are then a bit rounded on that same side. As for the 15 chain I worked the pattern stitch 4 times to line up with the rest of the rows (skip 2 ch pattern stitch in next ch, skip 2 ch pst in next ch, skip 2 ch pst in next ch, skip 2ch pst in next ch, skip 3ch and you are through). 14 chains would be better than 15. It would be more even and keep to the skip 2 pattern as there would then be 2 chains left after the 4 pattern repeats (instead of 3). is there a PDF to download instead of just printing ? Impatiently, in R. 5, I just did the 2dc, c1, 1sc in each across , chained 15 where indicated and continued the 2dc, ch1, 1 sc and did the same for R.6 – across the previous ch 15 I did the same skipping 2 ch along the ch 15 of the previous row – came out great and added another bit of interest. i also did the first and last 2 rows in one color and the middle rows in a second color – Thanks again. great design but confusing instructions – – I agree, think that R.1 in 4th chain s/b ch 1. dc in same st. We really need clear instructions for R.5 do we continue 2 dc, ch 1, dc in each ch 1 sp UNTIL we get to the first marker and then only in that ch 1 sp do we 2 dc, ch 1, SC? and in R.6 What do we do when we get to the ch 15? Thank you for a lovely design. Beautiful scarf, one I shall make very soon. Thank you for the wonderful patterns. From what I can gather, the 15 chain space is where you pull the scarf thru. Over the 15 chain you would just follow the same stitch pattern for that next row. I don’t understand the ch15 either. I have made several scarves without problems. This one does not make sense to me. I would like to make it. Will try this pattern this fall. Row 5? Chain 3 in each chain 1 space to first marker? Beautiful. Love the color choice. I did a macrame lawn chair many years ago in these colors. Thank you for sharing with viewers. This is so, so cute. It would make a great Xmas gift.